This image and information is provided by his mother and a friend from the local region. 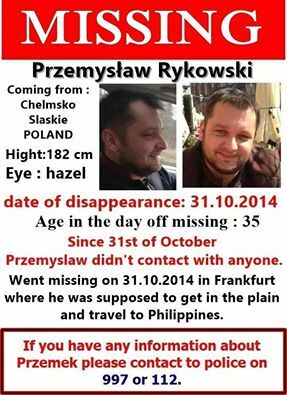 Przemyslaw Rykowski has not been seen or heard from since his arrival in the Philippines. He is 35 years of age and has hazel coloured eyes. His last sighting was in Frankfurt when he was boarding the plane. No other information is available at this time, Anyone who has seen Mr Rykowski should notify police or contact us here and we will pass along the information to the local officials.